My love for pozole has been rekindled thanks to a recent trip to the land of tequila and flip flops. It's not that I stopped liking it, but rather that I stopped coming across it. When we lived in Denver, Mexican restaurants where Grandma was hand making the tortillas in the back were on every corner. But in chi-town, the choice is often between a chain taco joint or a trendy new joint that puts more focus on the party than on the food. The good stuff is out there, you just have to know where to find it! I had the opportunity to talk with the head chef of an elite resort as well as a native who cooks for Gringos daily. My variation of this recipe is an amalgamation of their versions, with my interpretations added for fun. Chorizo meatballs replace calf head, dried oregano gives way to fresh and crunchy radishes sub in for iceberg lettuce on the top. The broth has flavor but is not overwhelming as it's meant to be the background; once you add on all the toppings, it becomes a really great blend of flavors. This recipe seems daunting at first look, and I'll admit - there are quite a few steps in the process and it does require a few pans. (Tip: I re-use the same pans and blender without rinsing, it really just adds more flavor!) The steps themselves are fairly simple. Whether you are falling in love with Pozole for the first time or merely comparing my version to your grandmother's doesn't matter. Think of this as a great stew that is perfect for Fat and Happy company! Fat and Happy Food Blog Tips and Techniques: When forming the meatballs, stop periodically and rinse your hands, but don't dry them. The meat will roll better with wet hands. In a large soup pot, start the Pozole Soup by placing the sliced onion and the full head of garlic (skin and all) with 8 cups of broth. 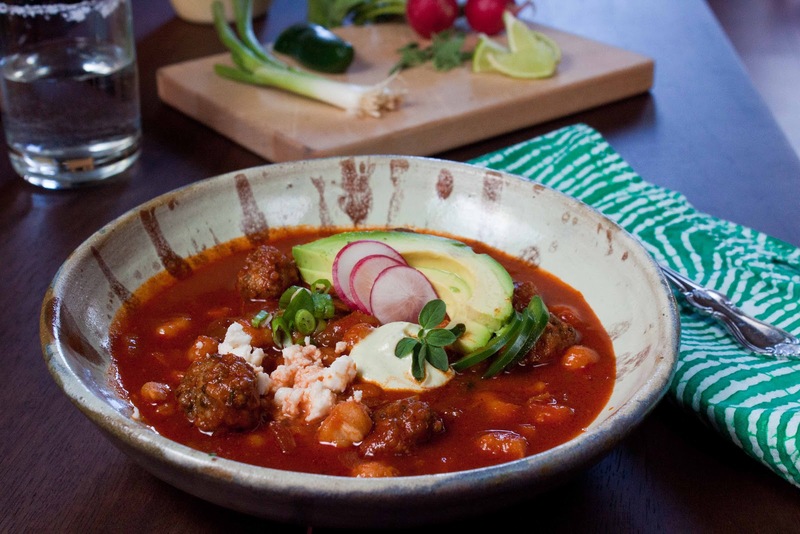 If you are using dried pozole, add it in now. Turn the heat on medium high and boil/simmer until the garlic is soft. Place the dried peppers in a 3.5 quart pot, fill the pot with water (it should cover the peppers, roughly 6 cups.) Cover and boil until the peppers are soft. Use a pair of tongs or large spoon to pick out the peppers and drop into a blender, reserve the pepper water. Carefully begin to pulse the peppers (hold the blender top with a kitchen towel) adding in scoops of the reserved water to help everything blend together. Ultimately you will use all the water. As you begin to to get the mixture moving, add in the 1/2 chopped onion and the 1/2 head minced garlic. Continue to add in the remaining water until the mixture almost soupy but still has a good, thick body to it. Let the blender run on high until the pepper sauce looks smooth. Add a few good pinches of salt. In a medium sauce pan, heat the canola or peanut oil over medium-low heat. Strain the pepper sauce into the oiled sauce pan and cook for about 10 minutes, stirring often. Use a spatula to work the sauce through the strainer. This will spatter a bit, so keep a cover on it. You will pour the pepper sauce into the boiling garlic water once the garlic is soft and had been removed from the simmering water. Remove the garlic head from the simmering Pozole Soup broth when it has softened, reserve for use in the Poblano Cream. Carefully add the meatballs to the simmering broth, pour in the pepper sauce and add in the pozole if you are using canned. Cover and let simmer on medium low to cook the meatballs. Taste the soup, add salt if needed. While the pozole is simmering, make the Poblano Cream. Roast the poblano pepper and quickly scrape off the skin (this will get strained so the pepper doesn't need to be too clean at this point.) Roughly chop the pepper and place in the blender. Squeeze the boiled garlic into the blender, each clove should just pop out. Pulse the pepper, garlic and cilantro until it combines. You may need to stop the blender from time to time to scrape down the sides. If needed, add a few drizzles of broth. Finish with a pinch of salt. This should be thicker than the pepper sauce but still able to pour out. Strain into a bowl. Add half of the pepper sauce into the pozole, lightly stir to incorporate; turn down to low. Add the yogurt to the remaining half, stir to combine. 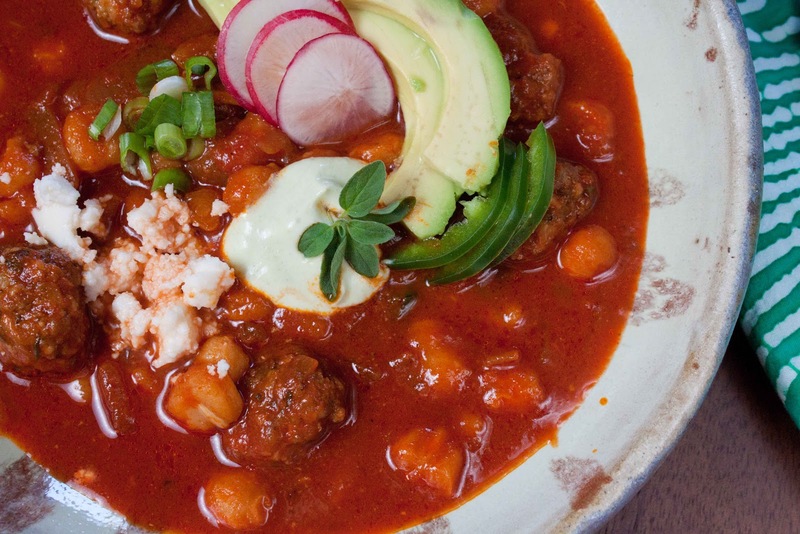 Ladle the pozole into a bowl, top with a scoop of the Poblano Cream and a spoon of all the remaining toppings. Serve with tortilla chips. In a small fry pan, heat a drizzle of olive oil over medium heat. Add the onions and garlic, saute until they become softened (about 3-5 minutes.) Remove from heat and cool. Using your hands, mix the pork, chorizo, onion mixture, cilantro, oregano, salt and pepper together. Form into small meatballs. They will be a slightly loose ball but should hold. If the meat is not staying together, you can add an egg and some bread crumbs to help them form better. Cook in the pozole soup as directed above. You can also brown the meatballs before adding to the pozole if you prefer to give them that rustic look. I like doing this, but it's a step that can be skipped.